Quickly find hundreds of resources for your classroom. We are excited about the potential of the Next Generation Science Standards (NGSS) to elevate how teachers and students tackle scientific and engineering problems. As students struggle to make sense of their learning, the NGSS provides the framework and practices to get students acting like scientists and promotes the need for melding engineering with scientific inquiry. Unfamiliar with the NGSS? Dive into this introduction, “Game-Based Learning and the NGSS,” to learn about the basics of the NGSS and how it can transform your classroom into a place where students are doing real science. 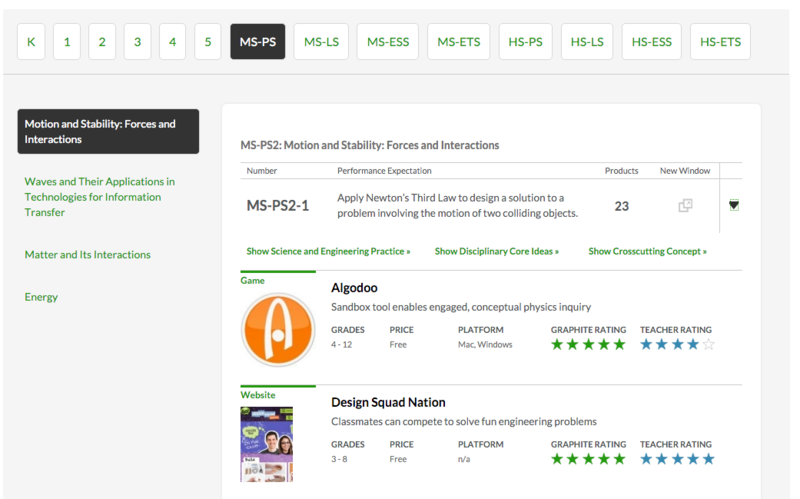 Our NGSS Explorer highlights hundreds of apps, games, and websites evaluated by our expert reviewers and tagged for relevant performance expectations (PEs). Finding the right tool for your NGSS-aligned lessons is as easy as selecting a grade, topic, and PE, which generates a list of suggested tools ready for classroom integration. We have also included the three NGSS dimensions -- science and engineering practices (SEP), disciplinary core ideas (DCI), and crosscutting concepts (CC) -- for quick and easy reference. The NGSS and edtech form a natural partnership, and while the NGSS Explorer bridges the gap between them, other great resources can help you enhance student learning in science. Below we highlight some of the top sites, apps, Top Picks lists, blogs, and Lesson Plans that maintain the spirit and intent of the NGSS. Some edtech tools are right on target for NGSS integration, while others adhere to more traditional methods of learning. Mosa Mack Science lies in the former category. Students solve a mystery, complete hands-on activities that extend their learning, and then apply that same learning to an engineering design problem. With lessons that involve students doing science, it's one of our favorites. Some other fantastic sites also put students at the center of the NGSS: Mystery Science builds deep understanding of scientific phenomena, Design Squad Nation lets students design engineering solutions, NOVA Labs uses real data to solve problems, and ExploreLearning Gizmos showcases the manipulation of variables in simulations. 4 Tips for Choosing the Best NGSS Edtech for Your Students: Knowing what to look for in an edtech tool can be difficult. As one of our expert reviewers, Emily shares her advice on avoiding traditional curriculum that claims a connection to the NGSS but ultimately misses the mark. Her tips will guide your research as your curate the best for your students. When finished, check out NGSS = Now Get Students Sold on Science for inspiration in creating a classroom where students are engaging in real and relevant science practices. Best NGSS Apps, Games, and Websites: Even when you know what to look for in a great edtech product, who really has the time to scour the endless Internet? Our team of editors has selected these excellent tools that pair perfectly with the NGSS, ready for you to integrate into the classroom immediately. Once you've explored the list, check out some of our other Top Picks: STEM Apps for Higher-Order Thinking, Best Engineering Tools, and STEAM Games, Apps, and Sites. Announcing the #STEMChallenge Winners! : Ready to use your favorite tool in a practical lesson that incorporates the NGSS science and engineering practices? Check out these lesson-plan winners from our STEM Challenge. These educators are taking science to the next level, and soon your classroom will be collecting projectile motion data of soccer balls and evaluating the competing design solutions of insulators.